Yes you heard it right. Physicists have just made what they say is the first ever device that's completely capable of producing particles that act as if they have negative mass. This particular device produces a peculiar particle that's half-light/half-matter, and as if that doesn’t sound cool enough, it might also be the foundation for a completely new kind of laser that could function on far less energy than present technologies. This forms on new theoretical work on the behavior of something called a polariton, which seems to act as if it has negative mass – a mind-bending property that perceives objects move towards the force pushing it, instead of being pushed away. Now physicists from the University of Rochester have created a device that allows them to actually create these polaritons at room temperature. They do this by manipulating captured photons and combine them with a kind of quasi-particle called an exciton to make something half-light/half-matter that some scientists affectionately refer to as 'magic dust'. This alone is "interesting and exciting from a physics perspective,” says quantum physicist Nick Vamivakas from Rochester's Institute of Optics. "But it also turns out the device we've created presents a way to generate laser light with an incrementally small amount of power." Before we get stuck into the lasers, let's first unpack exactly what this 'magic dust' polariton is. As we said before, creating a polariton involves combining a photon with a quasi-particle known as an exciton. If there was an orchestra for particles, there'd be sections for things like electrons, quarks, and photons. Strictly speaking, quasi-particles wouldn't qualify for a section of their own. They instead form out of the collective behaviour of other particles, much like a harmony of clarinets and flutes. Since they act like discrete, particle-like objects, they often serve the same purpose. The quasi-particle in question is called an exciton and it's an electron plus a kind of gap called an electron hole. The pair are bound together by something called a Coulomb force, often made when light interacts with certain materials. In the case of this study, that material happens to be an atomically thin semiconductor made from molybdenum diselenide. The researchers coupled the semiconductor with an optical microcavity – a tiny hall of mirrors used to confine a particular frequency of light to a standing wave. This combined the identity of the exciton with a standing wave of light to make a polariton. Such quasi-particles aren't exactly new. But according to the researchers, most polariton work until now has only been done on quasi-particles made out of neutral excitons and photons, and not on other complexes. This new device has allowed the researchers to probe the interactions between different kinds of polaritons. And it turns out they're incredibly weird. "By causing an exciton to give up some of its identity to a photon to create a polariton, we end up with an object that has a negative mass associated with it," says Vamivakas. Negative mass is a hard concept to wrap your head around, but it's important to consider the work in context. Mass is often observed as a resistance or response to a force. It's harder to push and to stop a bowling ball than a marble. An object that behaves as if it has negative mass, such as polaritons under these circumstances, will behave in unexpected ways. "That's kind of a mind-bending thing to think about, because if you try to push or pull it, it will go in the opposite direction from what your intuition would tell you. With the polaritons we've created with this device, the prescription for getting a laser to operate is completely different. “says Vamivakas. That could have some rather exciting applications, one of which being the stimulated emission of electromagnetic radiation. 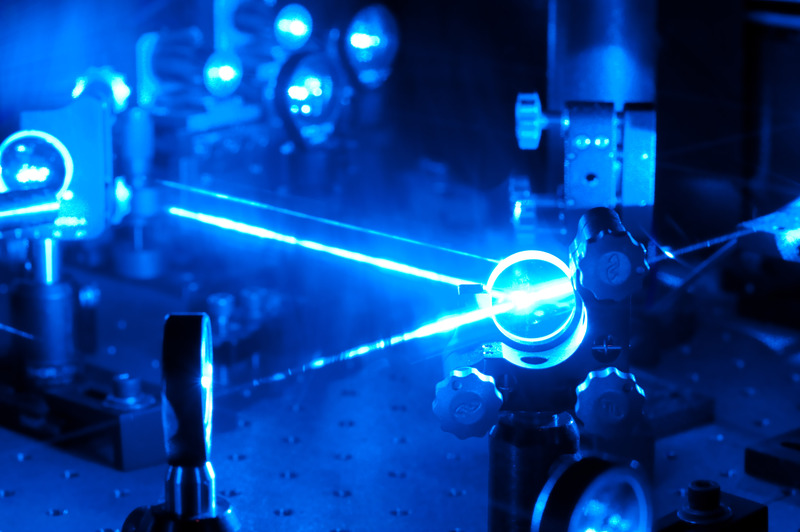 Something we more commonly understand as the thing that makes photons 'line up' in a laser. Ultimately exhibiting the characteristics of having a negative mass, the polaritons could help also create lasers with a much lower energy input. Quasi-particles have been big news in other areas of particle physics in recent years, showing potential in other technologies such as quantum computing. Physicists have even started to consider whether this 'magic dust' of light and matter could be used as the basis of a radically new kind of supercomputer. They might not be card-carrying members of the particle community, but quasi-particles are definitely weird enough for us to start paying closer attention. This research was published in Nature Physics. If this doesn’t blow your mind then we don’t know what will.